You will be given a reference e-book to read which has 261 pages And the test will be based on that e-book , you can take final test within 1 year of purchase. A project is a company specific endeavor that takes place over a definite amount of time. It does not follow the company’s general routine so it employs particular skills and resources necessary to reach objectives. Many times a team is developed to meet this task and people come together from different departments and even across the globe to make the project a success. Projects can include the development of software, construction or the expansion of sales market. Someone must oversee these ventures to make sure that results meet deadlines and budget expectations.Project Management is the use of systems, information, skills and experience to achieve a company’s stated objectives. Project management specialists supervise projects from beginning to end. A project manager’s role includes selecting team members and accepting responsibility for the overall success or failure of the project. Skills in communication, finance, scheduling, multitasking as well as strong leadership are all very important to become a successful project manager. Healthcare Information Technology (health IT or HIT) is the creation and maintenance of information systems for the healthcare industry. Automatic information systems that can be operated between many healthcare agencies are anticipated to lower costs, be more efficient and reduce errors. It is also expected to provide customers with better care and more efficient service. The Project Management (Healthcare Information Technology)Certification Course by Brainmeasureswill instruct participants in the many facets of project management and the use of Information technology in achieving goals. Professionals with a love for detail and seeing a project through to the end will enjoy the thorough treatment of the subject matter. Brainmeasures is an ISO certified leading online certification provider renowned for their world class teaching standards and skill testing. Enrollment procedures are simple and easy to follow. After becoming enrolled in this course by Brainmeasures, you will receive an E-book that will guide you and prepare you for the online exam. Upon successful completion of the exam, you will be awarded a certificate by Brainmeasures. Expected Salary after completing the Healthcare Information Technology Certification Course by Brainmeasures. The salary range of a project manager (healthcare Information Technology) can vary for a variety of reasons such as geographical location, amount of education, the work facility and the particular capacity of the job. This field is still developing and the U.S. Department of Labor has not listed salary data for this occupation. According to Indeed.com, a network for job recruitment and advertising, the average yearly salary for a project manager (healthcare information technology) is approximately $102,000. Introduces the 4IT Knowledge Management areas. Online courses allow you the freedom to learn at your own pace, in the comfort of your own home, without having to worry about time consuming commutes. When looking for an online course it is important to find one with helpful staff, experienced teachers and a track record of excellence. Brainmeasures is known for their well-designed courses and for this reason they are accepted worldwide. Recruiters and hiring agencies search for professionals with the right certifications. You can meet and exceed their criteria with an online certification from Brainmeasures. It is common for project managers to receive a bachelor’s degree in business administration or something similar and then pursue certification as a project manager from an institute. 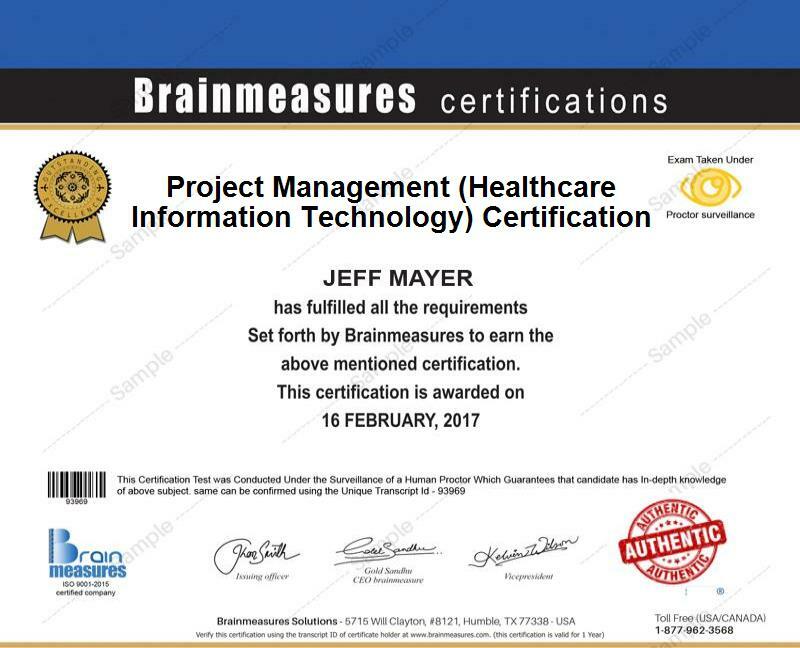 The Project Management/Health Information Technology Certification Course by Brainmeasures is the first step on this journey. It is advantageous for all individuals who are interested in obtaining careers in this field. Professionals who wish to be successful in the information technology industry will have depth and scope along with expertise.Another aspect involved is hands on training which comes later. Proper instinct and excellence in decision making comes from acquiring years of hands on experience through working with senior level managers in the field. This field is expanding rapidly and the skills that are learned through this course have many applications. Many titles will focus on project management or Healthcare Information Technology and some incorporate both. Here are a few possible career opportunities after the certificate is obtained.